I'm a rabid, raging, drooling, slavering fan of oversize lamps shades, whether they're of the floor, hanging, sconce or table variety. Thus I love Ron Gilad's Lamp No. 15 which is actually only 12" in diameter but seems crazy large compared to its tiny base. Honestly, this bit is lost on me "After observing and subtracting main characteristics of ex lovers, the designer abstracted these qualities and formed them into a series of table lamps. 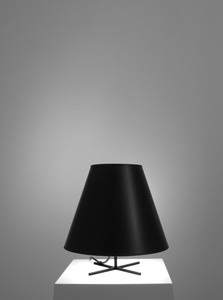 This series of lamps serves as the designer’s private 3D black book." No. 15 is $299 (which is a lot cheaper than No. 13 at $1,225 I have to say) and I have no idea what it says about relationships, but I do like what it says about being stylish. isnt it just a big shade on a small lamp? what about that costs $400 bucks? I agree with Van Lease, Its look really stylish.